Meet James, our brilliant Optometrist from Brighton. 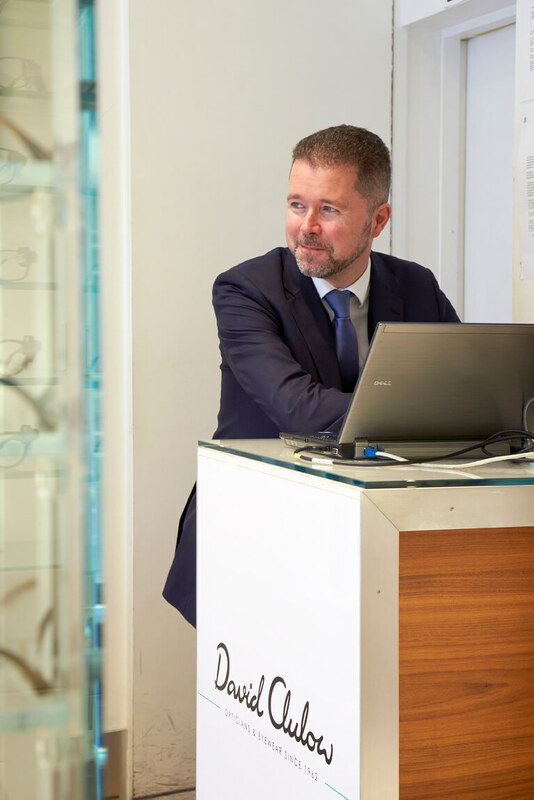 James studied optometry at Aston University qualifying in 1994 and has been part of the David Clulow Opticians family for 20 years. Showing your age there James…. He started in our Covent Garden Opticians, moving to our Hampstead store before settling down in Brighton, where he has been for 10 years. When James isn’t testing eyes in sunny Brighton he loves spending time with his young son and listening to music. We sat down with James to answer some of his most frequently asked questions working as a David Clulow Optometrist. Glaucoma simply put is a group of diseases that is usually caused by the fluid pressure being too high to maintain the normal working of the optic nerve. The optic nerve is what carries the information collected in the eye to the brain where it is processed allowing us to see. If the pressure gets too high it prevents the nerve in the eye from functioning properly causing damage and loss of vision. If the eye goes untreated this can lead to blindness. Glaucoma is more likely as you get older with 40 being the age where opticians start to routinely test for it. However it can develop at younger age in some people. The most common form of glaucoma has a slow progression and no symptoms until vision is affected. For this reason it is important to have regular eye examinations so that any signs can be detected as soon as possible before there is too much damage as the damage is irreversible. This type of glaucoma is usually treated with medication in the form of eye drops to lower the fluid pressure inside the eye and prevent any further damage occurring. Occasionally surgery is required to keep the fluid pressure low. A more rare form of the disease exists where the pressure rises very quickly in one eye resulting in eye pain, redness, hazy and blurred vision and seeing haloes around lights. This is seen as an emergency situation as the pressure needs to be reduced urgently and if you had these symptoms you should go to the local accident and emergency department. This is initially treated with a mixture of eye drops and oral medication. Once the pressure is lowered a type of laser surgery is usually performed to make sure that the pressure doesn’t rise again. This type of glaucoma doesn’t always have the sudden very high pressure rises but lower more moderate rises in pressure from time to time with pain, discomfort and hazy vision that comes and goes. It is therefore always important to attend for a sight test as soon as possible if you have any problems like this with your eyes. Glaucoma does run in families and the NHS provides free yearly sight tests for people who are over 40 and with parents, siblings or children with the disease. A cataract is the clouding of the clear lens inside the eye and it can occur in either or both eyes. The usual reason for this is ageing and occurs over a long period of time. The lens in the eye is used to focus light onto the back of the eye to from an image that is sent to the brain. The lens is located just behind the coloured part of the eye that is called the iris. It is important for the lens to be clear if we are to have clear vision. So as the cataract develops and the lens becomes cloudy and misty so does the vision. People with cataracts will notice that their vision loses its clarity; they might notice that the colour of things is different and they may suffer with glare from headlamps at night. Looking through a cataract is a bit like looking through a dirty window, so that how you see through it is affected by how light shines on it. Cataracts can also be caused by eye injury or chemical burn. Some babies can be born with a rare type of cataract and diseases such as diabetes can also cause cataract. When a cataract is in its early stages you may not have any symptoms at all but as it develops it is usual to notice symptoms. It is when the symptoms start to affect daily tasks such as driving that the cataract is usually ready for treatment. The only way to treat cataract is to have it surgically removed and replaced with a plastic lens. Having a regular sight test is important to check for the development of cataracts and to monitor their progress to provide you with advice and guidance. Conjunctivitis is the inflammation of the conjunctiva, the clear membrane that covers the white of the eye and the underneath of the eyelids. It is a very common eye condition. Conjunctivitis can be caused by infection of the conjunctiva by bacteria or viruses or by an allergic reaction to things such as pollen. Conjunctivitis caused by infection usually causes red eyes that sting and burn along with a sticky or watery discharge that depends on the type of infection. Often on waking up in the morning the eyelids will be stuck together and require bathing. Normally a conjunctivitis caused by bacteria can be treated with antibiotics but will often clear up on its own with out any treatment within 5-7 days. A conjunctivitis caused by a virus usually will clear up with out treatment within 2-3 weeks. If the symptoms persist or get worse then you should consult either your GP or your optometrist. Conjunctivitis caused by allergy usually causes red eyes that water and itch. This type of conjunctivitis is treated with anti allergy eye drops or medication such as antihistamines. This type of conjunctivitis will last as long as whatever you are allergic to is present in your environment. This is very common and we see this a lot in the spring and summer months when there is pollen in the air. A Stye is a bacterial infection of the base of an eyelash and its gland on the eyelid and appears as a tender red swelling a bit like a spot on the eyelid. Its medical name is External Hordeolum. It is a common condition that many have had and can appear when you are run down. Styes often get better without any treatment but can occasionally require antibiotics. The eye can be made to feel better by bathing it with a flannel that has been warmed in boiled, cooled water. Q: What is a Prism? A prism is lens that changes the direction of light rather than focus light like an ordinary lens. Prisms are usually used to correct weaknesses of the eye muscles that can cause double vision, eyestrain and headache. Sometimes people need a prism if there is a big difference in the prescription between the two eyes. Part of an eye test will check to see whether you need prism. Dry eye is the name for a condition that is caused by the tears in the eye not working properly to keep the surface of the eye moist. This could be due to there not being enough tears produced, the tears evaporating too quickly or to the tears not spreading over the surface of the eye correctly. The tears are made up of three layers and it is a problem with any one or all of these layers that causes the problem. The problems with these layers is often due to increasing age as the parts of the eye that produce the tears and spread them over the eye don’t work as well with age. There also some eye conditions that cause this problem as well. Dry eye make your eyes feel gritty, dry and burning. Your eyes might water as well which seems strange since your eyes are dry but this is because the eye is producing extra, watery tears in response to the drying. Often the eyes are red as the drying causes some inflammation of the conjunctiva, the clear membrane over the white of the eye. You can get blurry vision that comes and goes with dry eye. Often symptoms can be brought on by environments that bring about evaporation of the tears such as areas that are air-conditioned or centrally heated. The symptoms of dry eye are usually treated with artificial tear preparations that you can buy from the pharmacist. These usually help replace the watery part of the tears but there are some that try to help with evaporation of the tears. Dry eye can sometimes cause complications that can affect the cornea that is the clear surface over the coloured part of the eye and is very important for vision. It is always important to see your optometrist if you have any of the symptoms of dry eye. Short-sightedness or near-sightedness is when you can’t see things far away but you can see things close up. The medical term for this is Myopia. For you to be able to see clearly light from the object that you are looking at has to focus on the retina at the back of the eye. Short-sightedness happens because the eye can’t focus the light onto the retina from objects that are far away. This happens because the components of the eye don’t match up completely and the light from distant objects is focused in front of the retina. This can be due to the eye being a little longer than it should be or front of the eye being more curved than it should be. Short-sightedness is easily corrected with spectacle lenses or contact lenses. The lenses move the area of focus of light from distant objects onto the retina, which then gives you clear vision. The types of lenses that are used to correct short-sightedness are called concave or negative lenses that are thicker at the edges and thinner in the middle. Long-sightedness is when you can’t see things close up but you can see things far away. The medical term is hyperopia or hypermetropia. For you to be able to see clearly light from the object that you are looking at has to focus on the retina at the back of the eye. Long-sightedness happens because the eye can’t focus the light from objects that are close up. This happens because the components of the eye don’t match up completely and the light from near objects is focused behind the retina. This can be due to the eye being shorter than it should be or the front of the eye being less curved than it should be. If you have a lot of long-sightedness then even objects in the distance can be blurred and you will have difficulty seeing things at all distances. Long-sightedness is easily corrected with spectacle or contact lenses. The lenses move the area of focus of light from close objects onto the retina, which then give you clear vision. The types of lenses that are used to correct long-sightedness are called convex or positive lenses that are thicker in the middle and thinner at the edges. Q: What is an Astigmatism? Astigmatism describes a condition that affects the focus of light on the retina. For you to be able to see clearly, light from the object that you are looking at has to focus clearly on the retina at the back of the eye. An eye with astigmatism will focus light at two separate points, which causes the image and your vision to be distorted and blurred. This type of problem is caused by the curvature of the clear part of the front of the eye, called the cornea, or by the curvature of the lens that sits inside the eye. An eye without astigmatism will have curvature that is the same in all directions and is round like a football. An eye with astigmatism will have curvature that is not the same in all directions like a rugby ball. It is this difference in curvature that causes the light from an object to focus at two separate points. Astigmatism is corrected by spectacle and contact lenses called toric lenses. These lenses bring the two focus points together on the retina. Astigmatism is very common and in fact most of us will have a small amount of it. It becomes less common the larger the astigmatism is. Astigmatism usually occurs with short or long sight. The number 20/20 is a measure of the fineness of detail that we are able to see. This is often described as what average vision is. The correct term for this measurement is Visual Acuity if we are talking about how well you see with your glasses and unaided vision if we are describing how well you see without glasses. It is often asked that if you have 20/20 vision does this mean that your vision is perfect. What it means is that you can see fine detail well but it does not mean that your vision is perfect. This is because the fineness of detail that we can see is only determined by how good our central vision is and not how we see at the edges i.e. peripherally. An example could be that you have 20/20 vision but have a problem with your vision peripherally and that would mean that your vision is not so good. The measurement 20/20 is only used in North America where they use the imperial unit of feet, elsewhere, and like in the UK, the metric units of meters are used and the equivalent measurement becomes 6/6. Q: What causes bloodshot eyes? Bloodshot or red eyes can be caused by many things, almost too many to mention so we will deal with some of the common ones. Red eyes are caused usually by some sort irritation to the conjunctiva, the clear membrane that covers the white of the eye and underneath the eyelids. During an infection caused by bacteria, the excretions of the bacteria will cause redness and irritation along with the body’s response to fight the infection. With allergy, particles such as dust or pollen will cause an allergic reaction on the conjunctiva making it red. If you have dry eyes, the drying causes irritation and inflammation of the conjunctiva. Some people get red eyes in the shower due to the heat of the water or maybe some soap getting into the eyes. There are also some people who just have eyes that are redder than what is considered normal for no particular reason. There are some serious eye conditions that can cause red eyes along with pain and/or sensitivity to light. If you have red eyes that are painful you should always get them looked at by your optician or a doctor as a matter of urgency in case you have a serious eye condition. Q: What is Hay Fever? Hay Fever is an allergy to the pollen from plants and flowers. It is very common in the UK. It causes a variety of symptoms such as sneezing, runny nose and watery, itchy eyes. Q: What is Macula Degeneration? Macula degeneration is a condition that affects the central vision. It is a progressive condition meaning that it gets worse and worse. It is usually something that is age related affecting older people but there are forms of the disease that affect younger people. The macula is a part of the retina at the back of the eye and it is responsible for seeing detail. When you look at an object the eye focusses the image on the macula so that you can see the object’s detail. If the macula stops working properly, you lose the ability to see detail and this is what happens in macula degeneration. This means that tasks such as reading that require you to be able to see detail become difficult. Macula degeneration doesn’t usually impair your ability to walk around, as it doesn’t affect your peripheral vision. Macula degeneration is usually present in both eyes but not normally to the same degree in each eye. In the early stages of the condition, there are can be little or no visual symptoms and only an eye examination will detect the changes at the back of the eye. Symptoms when they appear can be blurred or smudgy vision. There might be difficulty doing a fine detail task like reading. As the condition progresses there are two types of macula degeneration: wet or dry. Dry macula degeneration is a slow condition that develops over years with gradual reduction in vision. There is no current treatment for dry macula degeneration. Wet macula degeneration develops much quicker over a period of days/weeks and is due to a build-up of fluid behind the macula. If detected early enough, there are treatments available for wet macula degeneration. It is always important to see your optometrist is you notice something happen to your vision suddenly.